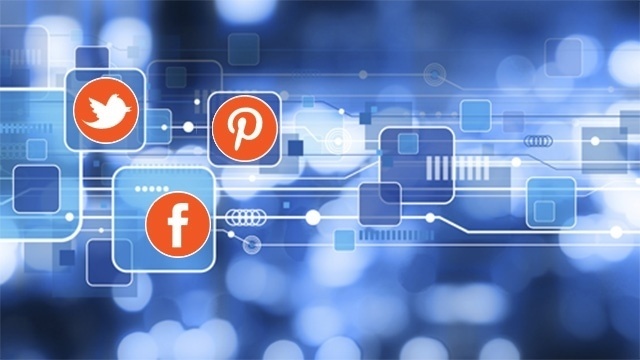 Did you know that almost 1.7 billion people have active social media accounts? The average user spends nearly 2 hours per day on social platforms. Between smartphones, desktops, tablets and watches, technology has provided us with endless opportunities to stay social throughout the day. With so many people interacting online, it’s time for you to bring your party to the people. Using social media networks to broadcast your GigMasters profile can be a powerful resource for you to reach new clients, and gain repeat customers. 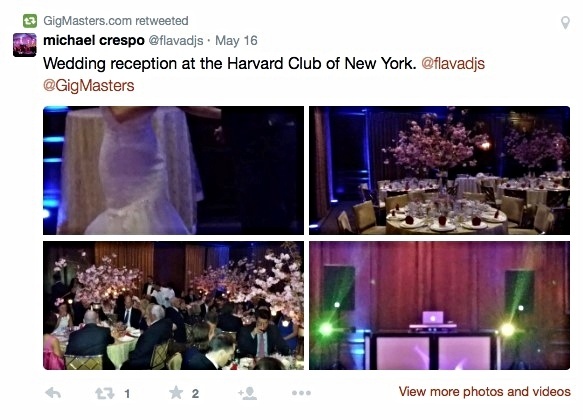 Think of social media as a party you don’t want to miss! Here are 4 simple ways to ways to get booked with the help of social media. As the most popular social networking site, Facebook provides endless opportunities for you to capture the attention of a large crowd. 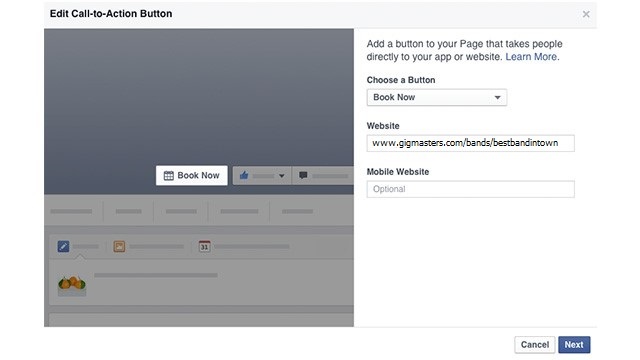 Like your GigMasters profile, you can use Facebook to share pictures, videos, and now, to get booked. The Facebook Call-To-Action feature makes it easier than ever for you to convert fans into clients. With it, you can direct fans to your GigMasters profile with the click of a button. 1. Log into your Facebook business page. 2. Click the “Create Call-To-Action” button located at the bottom right of your cover photo. 3. Select “Edit Call-To-Action,” and choose the “Book Now” option. 4. Copy and paste your GigMasters profile URL into the field labeled “Website,” then click next. 5. When asked where to send people when they tap the button on an iPhone or iPad, keep this on the option “Website”. The same rule applies for the Android destination. 6. Once you click “Save Changes,” you have successfully installed the button! Videos are the #1 most popular style of post on Facebook. In fact, 50% of Americans who use Facebook watch at least 1 video every day, and users are seeing four times as many videos in their news feeds than any other content. 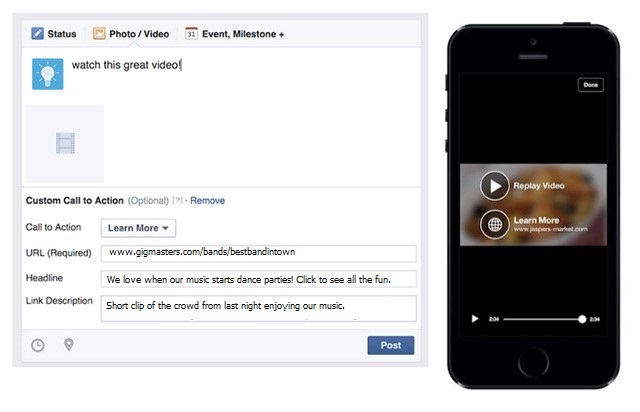 Luckily, Facebook also gives you the option to install a call-to-action to accompany your video posts. In case your fans missed the first CTA on your profile, here lies another opportunity to bring them to your source of booking. 1. On your Page’s status update box, click on “Photo/Video” to upload a video. 2. Select the video you would like to post to your Page, then click the “Add a Call-to-Action” on the bottom left of the status update box. 3. Choose the “Book Now” call-to-action option. 4. Copy your GigMasters member profile URL address and paste it in the box labeled “Website.” Click next. Whether you’re on your way to a gig you’ve spent weeks anticipating or you were the crowd’s favorite at a performance, share your success on Twitter! Not only will your followers see how amazing you are, but we’ll be on the lookout, too! If you tweet @GigMasters, we’ll retweet to our 7,000+ followers. 1. Compose a tweet of a picture, a great review, or anything about your gig. You can even add your profile URL. 2. Mention @GigMasters in your tweet. 3. Once we see that you mention us, we’ll retweet your mentions. If you add your profile URL to the tweet, you'll greatly increase your chances of a new visitor stumbling across your page! There are over 70 million pinners on the hunt for party inspiration, DIY tips, and recipes. What better way to reach your target audience than this go-to platform for party inspiration and purchases? If you use Pinterest to show off your services, not only could your pictures attract pinners looking for entertainment - they can also direct people to your profile. Pinning pictures from your GigMasters profile is easy! 1. When you are viewing the media section of your GigMasters profile, use your mouse to right click the image you would like to pin. 3. 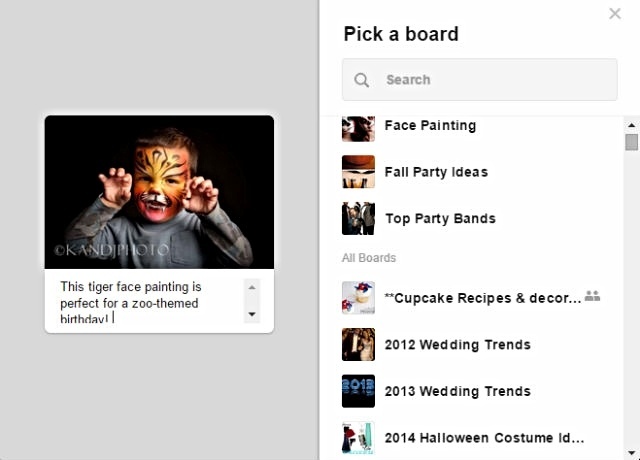 From there, a pop-up box will appear with your boards from your Pinterest account. 5. Since you are already pinning from your profile, you don’t even need to add your URL. It is automatically added for you. * When writing a description, it is important to keep in mind the types of words pinners use to search. For example, if you're a face painter and would like your picture to reach someone looking for party entertainment, a description like “Face painting is the ultimate party entertainment idea!” or “This tiger face painting is perfect for a zoo-themed birthday,” will give your pin the chance to appear in the feed for clients who search terms like “Zoo party theme,” or, "party entertainment ideas." We hope you'll use these strategies to spread the word about your services. If there is a social tool that we didn't list that's helped you to drive more bookings, feel free to share it below!